When the combination of mandolin and guitar comes up, it’s all too easy to recall some of the more significant recordings that use this same coupling. The Tone Poem series, especially the first one by David Grisman and Tony Rice, probably heads the list for many folks, and rightly so, but just as important are musicians like Bill and Charlie Monroe, Ira and Charlie Louvin, Sonny and Bobby Osbourne, and Homer and Jethro. This pairing of the higher pitched mandolin and the mid-ranged guitar often results in a pleasing blend of timbres and textures. 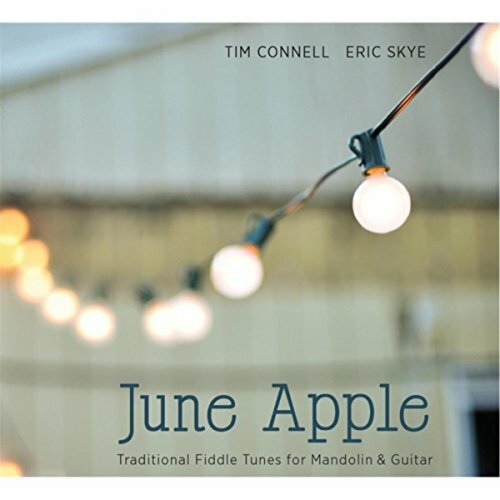 So in 2016, we have a new recording of mandolin and guitar from Tim Connell and Eric Skye called June Apple. Both Connell and Skye are based in Portland, Oregon. Neither one has been particularly connected with traditional music before now. Tim Connell is more often associated with choro and gypsy jazz than anything else, though he is now working with an Americana acoustic group, The Old Yellers. Connell mainly plays on a Paul Lestock Arrow mandolin. Eric Skye is known for his new acoustic music and west coast jazz, and plays guitar in both fingerstyle and flatpicking-style. He mainly plays on a Santa Cruz small-bodied 00-Skye, which is his signature model in the Santa Cruz line. The subtitle of this recording really tells the listener what to expect for the most part, it is: “Traditional Fiddle Tunes for Mandolin and Guitar.” However, it doesn’t really tell you the whole story. But there are 12 tracks on the recording and all except for two tunes are traditional tunes like “Angeline the Baker,” “Billy in the Lowground,” and “Saint Anne’s Reel.” The two exceptions are “Black Butte Waltz” by Connell and “The Locktender’s Reel” by Skye, but they blend effortlessly with the other tracks. Most of these tunes are played at a somewhat slower tempo than which they are usually heard. Connell and Skye don’t play them slow exactly, but they leave plenty of breathing space so you can hear the tune and they can play with the timbre of their instruments. In June Apple, it all about tone for these two players. Whether they are accentuating the warmth and roundness of the tone, or making it bright and sparkling, each track explores a different approach to tone color and style, and frequently a tune will feature multiple tone interpretations. Connell can bring out the fullness and richness of his Arrow mandolin until he almost sounds like a guitar, but then he can turn it around and the woodiness and percussive presence is right there again. With Skye, at times he mutes the strings as he plays and at other times he plays with full rich resonance. There are even times he surprises you by sounding almost like an electric guitar. While both Connell and Skye are known for being one-instrument musicians, you really couldn’t tell that by this recording. They make it sound like they have an arsenal of instruments to choose from at any given moment. It’s a mark of each person’s virtuosity that they make it sound so effortless. Their range of tones seem endless. Bottom line, June Apple is one of those all too rare albums that I feel will stand the test of time and should be considered a classic recording that deserves to be in everyone’s collection. Along with Grisman and Rice’s Tone Poems and several of John Reischman’s albums, June Apple is going to stay close at hand, because I can’t see myself ever getting tired of it. June Apple’s foundation is traditional, but Tim Connell and Eric Skye make it sound fresh and new at every turn. This is a fantastic recording. Track List: June Apple; Fisher's Hornpipe; Cold Frosty Morning; Black Butte Waltz; Saint Anne's Reel; Temperance Reel; Angeline The Baker; Cherokee Shuffle; Snowflake Reel; I Am A Pilgrim; Billy In The Lowground; The Locktender's Reel.